Earlier this summer, we added a fire pit to the back yard. It’s a project I’ve wanted to do for years, but just never had time. I have to say that I’m surprised by the location it ended up with. For years I’ve envisioned it on the opposite side of the yard. When it came time to start digging, however, I automatically moved to a location I’d never considered. 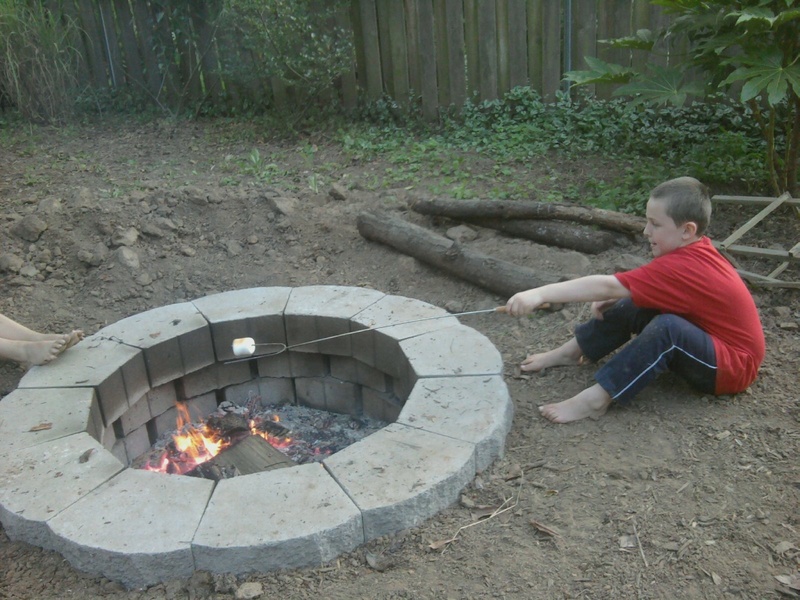 Wyatt roasting marshmallows during the christening of our new fire pit. Building a fire pit is pretty simple, but definitely not easy. Available Materials: Gravel left over from another project; manor stones left over from another project; shovels; a bucketful of sweat. Time to Complete Project: About 10 hours. Step 1: Figure out where you want to put your fire pit. This is probably the most important step. The location has to work with the layout of your yard. Remember, the whole point of a fire pit is to have a fire. Not a good idea to put it right next to a pile of seasoned wood or the shed where you store flammable chemicals. Also, consider overhead clearance. Don’t place it under an awning or a low hanging branch. Step 2: Dig. And dig. And dig. Of course the digging takes a little bit of finesse. 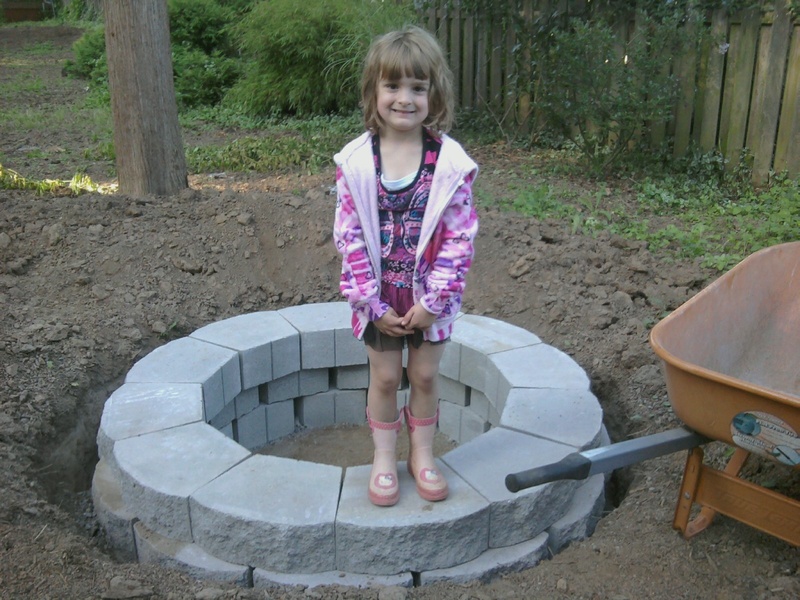 If you’re making a round fire pit, like mine, then you’ll want to dig in a circle. As much as I wanted to stop digging two inches in, that just isn’t safe. I went down about two feet. When the hole was the size and shape I thought it should be, I realized that I wasn’t sure that it was really the right shape. Step 3 (Confession – My steps are out of sequence. Step 3 for the smart fire pit builder should be step 2. ): About the time I thought I was done digging, I realized that from my back deck, which is two stories up, I had dug an egg, not a circle. It was time to true up my shape. I’m a simple girl with simple means, so I make do with what I have. I grabbed a stick out of the yard (probably a small branch that self-pruned from one of the five thousand trees in my neighborhood) and some twine I use for gardening (some plants need a little encouragement to stay upright) and made a make shift drafting tool. I tied the twine to the stick, drove the stick into (what I thought to be) the center of the circle. Then I pulled the twine to the edge of the hole and walked around in a circle using a weeding tool to score the ground in the shape of a proper circle. When I finished, I was a wee bit dizzy and had a lot of digging ahead of me. Step 4: Dig until you have an actual circle shape. Mine ended up around 5 feed wide. Step 5: Level the bottom. I’m not a perfectionist, so I didn’t get out my level and double check at this stage. I just eyeballed it and called it good. Step 6; Inside the outer edge of the fire pit, dig a trench down about two inches. The goal here is to dig down deep enough to lay in a layer of gravel. I used 5/8 minus. The gravel will be the foundation for the manor stones that ring the fire pit. It’s common to use sand when setting smaller walls or building a path, but with larger blocks, like manor stones, gravel does the trick nicely and is easier to work with. Step 7: Build your base layer of manor stones. Take your time and get it level because everything that comes next rests on this level. This stage caused me to swear more than my kids are accustomed to hearing. I have a three foot level, so I was able to level the blocks side by side and across the opening. Step 8: I wanted the second ring to be flush straight up and down with the bottom layer. Manor stones come with a lip on the bottom that makes for a great, super-stable wall, but I really didn’t want a cone shaped fire pit. If you have a hammer or a five pound mallet, you can easily knock that edge off. You might want to wear eye protection as bits of concrete are going to fly all over the place when you do it. Or maybe that’s just what happens when you use the hammer to pound out your frustration from all the leveling in step 7. Step 9: For the top ring, I left that lip in place. I wanted the extra integrity since the final level is mostly above ground. Step 10: Light your first fire, roast a marshmallow (or hotdog) and enjoy. Note: I really wanted to put sand in the bottom of the fire pit, but was not successful with procuring sand (urban farmer on a craigslist budget remember). I was obsessing about getting sand and then I realized that it didn’t really matter. a layer of dirt at the bottom was just as good as a layer of sand any day. It works find, is cheaper, and already in my back yard. I’m calling it a win. Lily showing off her hard work.